We are also available after hours and Sunday by special appointments. Get directions to our San Francisco location. Gilmans Kitchens and Baths has been proudly named a Legacy Business by the city of San Francisco for serving the San Francisco Bay Area community for 35 years. Clients can find the SF showroom still at its original location. In keeping true to our roots, we still service door and window screens and have added complete kitchen and bath products, as well as professional design and contractor services. Gilmans treats every job with the utmost priority and importance. 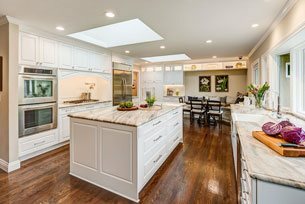 Our reputation and dedication to quality service and products have made us a trusted name for providing semi-custom to full custom kitchen cabinets, bathroom vanities, plumbing, decorative hardware and complete kitchen and bathroom remodeling in San Francisco. If you live in San Francisco, South San Francisco, Brisbane, Daly City, Millbrae, Pacifica, San Bruno, and the surrounding areas, visit our showroom today! Make a statement in your home with top-quality kitchen cabinets from Gilmans. We offer kitchen cabinets in a variety of colors, textures, door styles and brands. Whether you want a more traditional kitchen with cherry or mahogany cabinets or a modern feel with bamboo or acrylic, we have the perfect options for your style and budget. Visit our San Francisco showroom to speak with one of our designers to schedule your kitchen cabinet remodeling service. I'm very glad that I found John Keplar and the Gilmans team through a recommendation from my contractor. John made the cabinet and countertop selection process so much easier and less stressful than I had imagined it would be. He is a good, thorough designer and provides friendly, responsive customer service. At Gilmans, our incredible designers help you create the bathroom of your dreams, combining style and function. We offer top-quality bathroom vanities from brands like Jeffrey Alexander, Dura Supreme, and Woodpro. With a wide selection of wood finishes and laminate cabinet options, we can help you create a chic, traditional, or even modern space. Visit our showroom in San Francisco to get started on your bathroom remodel and receive assistance choosing the perfect bathroom vanity for your needs! I was delighted to find my experience with Gilmans Kitchens & Baths to be easier than I thought it would be. I especially wanted to recognize the service and design skill of my designer, Jane Regan. Her knowledge made the selection process simple and always followed through. Overall, the experience was excellent. We work with homeowners, independent designers, and contractors on kitchen and bathroom remodel projects and offer the highest-quality products on the market. Our four different showroom locations allow customers to experience the quality and service that is synonymous with our name. When you choose Gilmans Kitchens and Baths, you are able to work with a professional designer to help you choose the right products, colors, and styles for your bathroom or kitchen remodel. Our skilled designers are current on the latest market trends and regularly attend education courses in the industry. Our kitchen and baths designers offer our customers the absolute best in home improvement. Our designers are happy to work with current plans you have with your contractor, or to start from scratch with simple rough measurements of the space you are remodeling. If you need assistance taking measurements, we also offer an in-home measure service. I was deeply satisfied with the amount and quality of communication from Gilmans, especially with my designer, John Keplar. He listened to my wants and requirements and followed through accordingly. John offered advice and guidance but always made sure I understood it was my kitchen, and I needed to be happy with every choice. He joined me when I choose other elements of the kitchen which I didn't purchase from Gilman. This I found to be up above and beyond my expectations! Deliveries and scheduled work was always done as promised. Gilmans works with customers from the beginning of the project to completion. Our services include full design, install-only for clients who already have their own contractors, or a full contractor service, where our Design Build team serves as the licensed contractor. We also offer a Handyman service for small quick projects. With the Gilmans Design Build, our full-service team will hold your hand every step of the way. Our team provides full Auto-Cad renderings for the cabinetry, tile, flooring and lighting. Our team works efficiently at obtaining permits, demolition, installation and every part of your kitchen or bath remodel. If you have already chosen a contractor, we are happy to provide installation of cabinets from our cabinet manufacturers, including Bellmont Cabinet Co., DeWils Fine Cabinetry, Dura Supreme Cabinetry, KitchenCraft Cabinetry, and Wood-Mode Fine Custom Cabinetry. We recognize the importance of each bathroom or kitchen remodel to be done on time and on budget. Our professionals have experience working with a wide range of budgets. Gilmans works with the same amount of passion and knowledge whether working with simple remodels or large scale projects. With four convenient locations throughout the area, we are confident that we can meet all of our client’s needs. We proudly serve residents of San Francisco and the surrounding areas including, Brisbane, Daly City, Millbrae, Pacifica, San Bruno, and South San Francisco. Contact us today to schedule an appointment at our San Francisco showroom to meet with a designer and get started on your dream kitchen or bath. San Francisco and the surrounding areas have been hugely impacted by the recent fires. We extend our condolences and our hearts go out to all who have lost family, friends, or their property. While first responders and firefighters have bravely fought to reduce the affected areas, we understand that some individuals have lost everything they own. If you have been a victim of the recent fires in the San Francisco area, we have designers ready to help you through reconstruction. As a gift from us, we’d like to offer you special pricing to help you through these trying times. 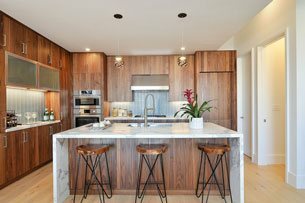 How much does it cost to renovate a kitchen in San Francisco? Kitchen remodels in San Francisco will generally cost around $75K to $140K. The overall cost will depend on multiple factors like the size of the kitchen, the location, types of materials used, as well as any additional customizations. It’s important to understand how your costs breakdown when remodeling a kitchen. 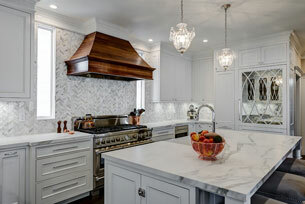 Want to get a general estimate of your next kitchen remodel? Try our Budget Calculator now! 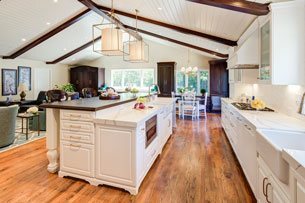 Financing for a kitchen remodel can be a big decision, but the return you’ll receive in added value to your home can make it a worthwhile investment. In San Francisco homes, an upscale kitchen remodel may cost around $140K, but you’ll likely receive a 99.7% return on investment, adding $140K to your home’s value. Bathroom renovations and remodels in San Francisco will generally run you anywhere from $24K to $70K. The cost of your remodel will depend on the size of your bathroom as well as which features you choose to replace. 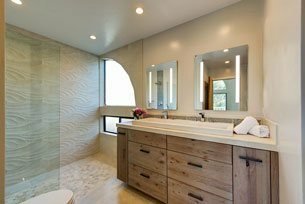 How much value does a bathroom renovation add to homes? An upscale bathroom remodel in San Francisco, will cost around $70K with a 94.9% return on investment. As this is an approximate estimate, your actual cost will vary depending on the size and scope of your project. Get started on your project! Call now!